MR. RUSSERT: How can Americans be asked to contribute, to share the sacrifice of our men and women on the ground in Iraq? 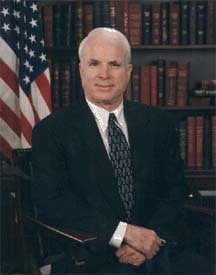 SEN. McCAIN: We should expand Americorps. We should expand the Peace Corps. We should encourage people to join a neighborhood and community volunteer organization. We should implement a 15-month service in the military in return for $15,000 in educational benefits. We should ask Americans to serve their country, not only because of this war but because of the ongoing war on terrorism and Americans will respond. They want to be told more than just take a trip or spend money. And everywhere I go, Americans ask that same question of me: How can we better serve and win this war on terrorism? We should ask more of them. You’d be amazed at the response. Americorps is a wonderful program. Peace Corps is a wonderful program. Volunteering in a myriad of community and neighborhood organizations and perhaps ask for some additional financial sacrifices as well.